The Nelson Corey farm is historically significant for its architecture and for reflecting the agricultural prosperity of Oswego County in the late 19th and early 20th centuries. 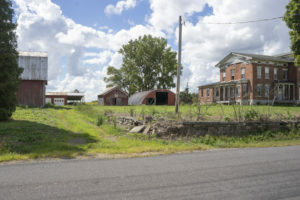 PACNY has selected the farm for listing as a threatened property because of the need to raise awareness about its deteriorated condition and uncertain future of this important part of Oswego County’s rural heritage. Located northwest of the hamlet of Pennellville halfway between Fulton and Brewerton, the Nelson Corey farm is a legacy of the agricultural economy that dominated Oswego County in the 19th century. 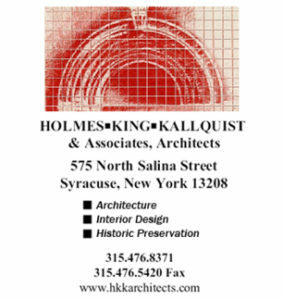 Its most prominent feature is an elaborate two and one-half-story brick Italianate house, designed and built by Nelson Corey in 1875-1876 at a cost of $10,000. 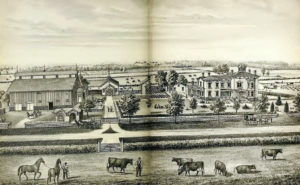 It was reputed to be the largest farmhouse in Oswego County at the time and was part of a model farm that was highlighted in Johnson’s History of Oswego County (1877). Nelson Corey sold the farm soon after completion of the house, but the farm continued to prosper into the early 20th century and saw the addition of new barns and outbuildings, including a unique cast-stone silo. Decline began in the Depression, when the cupola on the house was removed, and in ca. 1980, a fire damaged portions of the interior. The owners made repairs and agreed to designation of the house as a local landmark by the Phoenix-Schroeppel Historic Preservation Commission in 1987. Despite the landmark designation, the Nelson Corey house has stood vacant for decades. There have been offers to purchase the property, but the current owner has not followed through on a sale. The house has broken windows, missing and collapsing porches, and deteriorated woodwork and masonry. The barns, including one that stood when the house was built, are in poor condition. The cast-stone silo has lost its roof and the stone wall that borders Godfrey Road has collapsed. While much of the rural farmland remains, some of it has been lost to residential development. 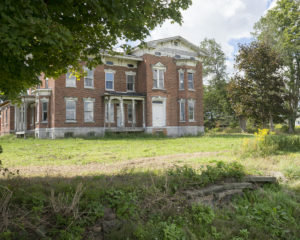 PACNY hopes that listing the Nelson Corey farm as a threatened property will raise public awareness about this significant property and increase interest in its rehabilitation and continued agricultural use. 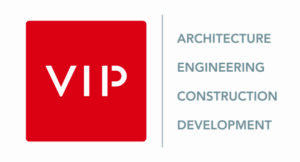 Rehabilitation of the buildings could employ both state and federal historic tax credits. Although the SHPO has not evaluated the property, it appears to meet the criteria for listing in the State and National Registers. The town and county should also seek to conserve the Nelson Corey farm’s agricultural land to sustain agricultural use and preserve the historic rural character of the property.